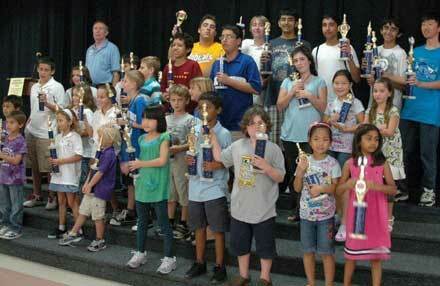 Our final National Chess Day round-up covers events in Alabama, Arizona, Missouri and Florida. See our first round-up (Memphis, Chicago and Skokie) and second round-up (Freeport, Bakersfield, Corpus Christi and more.) Also check out GM Kaufman's report on the big Grand Prix, the Continental Class Championships, which coincided with NCD. The atrium of the Brookwood Village Mall had an unusually large group of people gathered around 9am this past Saturday morning. Rows and rows of chess pieces were meticulously set-up on their boards and a table full of splendid chess trophies, chess medals, gift certificates were on display as one of Alabama's most respected scholastic tournament director, Caesar Lawrence was busily at work on first round pairings. Another table had a full range of US Chess Federation promotional materials, sample issues of Chess Life for Kids, chess handouts, chess tips and a large demo board that featured the Chess Day challenge puzzle were all set to go. Chess Day in Alabama went public! The scholastic players eagerly awaited the first round pairings. After a reading of the proclamation issued from Alabama's Gov. Bob Riley declaring October 9th as Chess Day in Alabama , Caesar Lawrence began the tournament with his inimitable and familiar declaration, "Shake hands and let's play chess!" And a full day of chess excitement and chess promotion began. 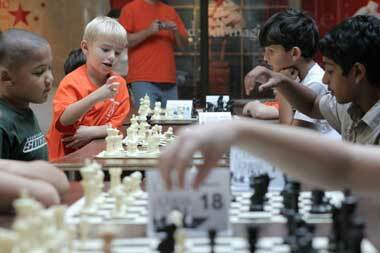 Brookwood Village, one of the busiest malls in Birmingham, Alabama was the venue for the first annual Kids Helping Kids Chess Day Scholastic Tournament. This very high people-traffic area was deliberately chosen as our tournament site so that chess was visible and very real to the public. It worked as hundreds of mall shoppers stopped to watch the scholastic players, some as young as five and six years old playing with the intensity of seasoned masters! 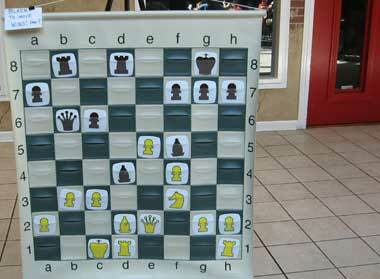 About a dozen passerby's inquired about how to get chess programs started at their schools! Many children who came across the event while walking through the mall wanted to learn how to play. We ran out of promotional materials long before the end of the end (note to self - need much more for next year!) It was a chess public relations dream! 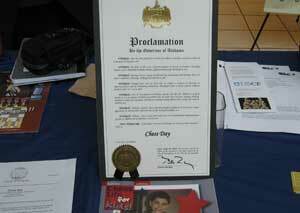 The Chess Day tournament bottom line was to promote chess and was to benefit Alabama's Children's Hospital. All the entry fees collected went to Children's Hospital and Children's Harbor located in downtown Birmingham. Children's Hospital promoted the tournament through their Facebook page and the local media mentioned the event. 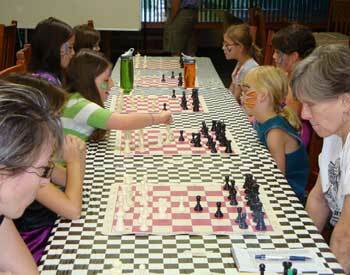 School chess clubs were encouraged to come out and area libraries helped promote the event. Before beginning his third round game, John Lawrence, a 4th grade student at Advent School in Birmingham, said, "I really like to help promote chess, play chess and know I am helping kids who are in the hospital and couldn't be here. " To attract rated players and beginners, TD Caesar Lawrence organized a rated section and an unrated section. Caesar quickly got into action with well-designed Chess Day tournament fliers and collectively we networked with many area schools. Children's Hospital and Brookwood Village's Books-A-Million store were sponsors of the event. The whole event was done with no cost to us and the sponsors were very happy to help promote chess. Colonial Properties donated the space and provided tables and chairs. US Chess Federation certified scholastic coach David Kwong was on hand to give tips and go over games with the players in post-mortems. Many parents volunteered to help with set ups and some logistics. Being Chess Day even the parents got into the spirit when on the side tables many games were being played by parents and coaches. So, for the day, college football took a backseat in Alabama as Chess Day captured the imagination of Birmingham's scholastic chess players and many new potential chess enthusiasts. The State of Alabama Chess Day proclamation said it all, "Alabama scholastic chess activities...builds lasting friendships..." A good time was had by all! The Chess Club and Scholastic Center of Saint Louis celebrated National Chess Day on Saturday, October 9, with its second annual 2-on-2 Team Championship. The event featured 44 people and 22 teams for a four-round, G/75 event with a total prize fund of $1,200. GM Ben Finegold and his son Spencer Finegold entered the tournament as the favorites and did not disappoint with a combined score of 8/8 to bring home $500 and the championship title. Their team, ironically named Two Persons is Not Really a Team, made quick work of the opposition including a round three trouncing of Masters Ron Luther and Bob Holliman. Spencer Finegold's 4/4 score pushed him over 2000 for the first time ever, earning him the expert title and an unofficial rating of 2009. Expert Mark Ferber continued his impressive string of tournament performances. Since winning the reserve section of the Saint Louis Open in April as an unrated player, Ferber has consistently demonstrated strong play and finished this tournament with a score of 3/4 and an unofficial rating of 2136 after just 30 rated games. During that span, Ferber has notched 22 wins, four losses and four draws. 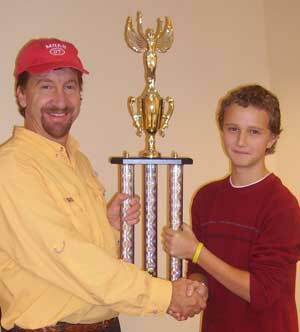 This tournament, Ferber formed a team with young Jason Zhou to compete for the U3600 prize. Jason scored a nice upset with a round two draw against Holliman and a final score of 2.5/4. Ferber and Jason, The Innocent Movers, took clear first in the U3600 division and $200 each. There was four-way tie for the U3000 prize between John Slattery, Sathya Anand, Aravinda Ganapathy and Aadithya Palaniappan. Each took home $50. The U2400 section eneded in a six-way tie giving each player $16.50: Nathan Phan, Clark Berry, James Elliott, Gus Cappiello, Dan Thurber and Michael Kelly. The Chess Club and Scholastic Center of Saint Louis just released details of the 2011 US Chess Championships. In Tucson, Arizona 9 Queens, Bookmans and the Girls Scouts of Southern Arizona celebrated National Chess Day at the 2nd Annual All Queens Day. Activities included free community chess lessons, face-painting, a make your own chess crown arts and crafts station, and ladies-only chess tournament for chess queens of all ages. Below is a game from the final round in which Tucson Ladies Chess Club regular Ann Price battled Angela Kinsey for first place in the Championship section. 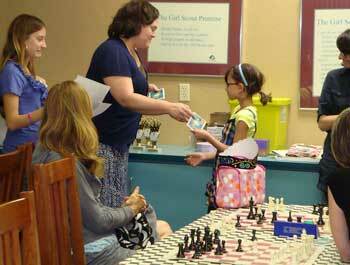 Participants in the tournament received prizes including custom 9 Queens trophies and gift certificates from Bookmans. That same day in Philadelphia, 9 Queens partnered with ASAP (After Schools Activities Partnerships) to host a 9 Queens Academy, in which WIM Alisa Melekhina, WGM Jennifer Shahade and Masterminds coach Leteef Street gave basic tips and played a competitive team game of "Chess Jeopardy." The next Philly session is on Saturday, November 13th. Contact Windsor Jordan at [email protected] or 215-545-2727 (ext 18) if you are interested in attending. The Weiss School celebrated NATIONAL CHESS DAY by hosting its Third Annual Rated Scholastic Chess Tournament on Saturday, October 9, 2010. The Tournament was organized and directed by this writer, John Dockery, President/Tournament Director of Palm Beach Gardens Chess Club. Since this was a special occasion and to celebrate National Chess Day, Mr. Dockery had 10 Trophies for each Division instead of the usual 5 Trophies. There were a total of 57 children participating in the tournament as well as several schools competing for Team Trophies. There were 75 trophies available to individual and team winners. Several schools participated and top honors went to Elbridge Gale Elementary, The Weiss School, Boca Raton Community High School, Freedom Shores Elementary, Equestrian Trails Elementary and The Benjamin School. Everyone had a great time including the parents. Thanks to the Head of School Dr. Rosemary Daniels, Dr. Denise Spirou and Mrs. Ellyn Zarek for all their help. Everything was very well organized and the children and the parents enjoyed the event. Our next Scholastic Tournament will be held at Palm Beach Day Academy on Saturday, January 22, 2011 located at 1901 South Flagler Drive, West Palm Beach, Florida 33401. For more information please call the President/Tournament Director John Dockery at (561) 762-3377 or visit our website at www.palmbeachchessclub.info. See complete crosstables on the USCF MSA page. 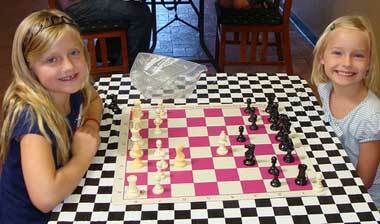 To celebrate National Chess Day, the Utah Chess Association sponsored the annual Utah Open tournament. It was the strongest field in Utah since the end of the era of GM Igor Ivanov. Two masters and two 2100 players topped the list. When top-rated Harold Stevens lost to his chess nemesis, Frank Flynn, it opened the field. Twelve-year-old Kayden Troff, also known as "Utah's Mozart of Chess," crossed the finish line first with a perfect 4-0 score plus one bye. Kayden narrowly missed the Utah Open title two years ago, at age ten, when he went into the final round a half point ahead of the field but lost a complicated last-round game on board one. After finally earning the monumental title of Utah Open Champion, Kayden learned he had been awarded the prestigious Schein-Friedman chess scholarship! It arrived just in time to help sponsor his trip to Greece next week where he will represent the United States in the World Youth Championships. Steve Gordon took clear second place in the Open with four points and a wildly tactical final game. Brenda Ahlemann and Jamie Olsen-Mills drew in the final round to tie for the state women's title, while rising young star Davis Unruh earned the under 2000 prize and trophy. Michael Parsons secured the under 1800 prize and a place in the Utah Closed Championship tournament next month. Aaron Case won the Under 1600 section, with Brad Tew and Jeff Evans close behind. The u1400, u1200 and u1000 trophies went to youngsters Andrew Roach, Clancey Black and Gatlin Black. Tournament newcomer Mitchell Sailsbery won the Under 800 section with a convincing 7-0, with Tommy Jones taking second place. The Utah Open High School Champion is tournament veteran Eliza McIntosh. Harrison Unruh earned the Junior High title and Sam Mason took home the Elementary trophy. UCA President Grant Hodson played skittles games with several of Utah's young stars at this event, and reports that their strategic and tactical skills are far above their current ratings. On National Chess Day, he affirms that the future of chess in Utah is brighter than ever.